Some might call it a marketing gimmick, but the entrancing blue light effect is real! Although it doesn’t suit everyone’s taste, blue fluorescence is captivating for most of us, especially when chosen properly. In this review, we’ll have a thorough look at Brian Gavin Blue. These are Brian Gavin diamonds that have medium, strong, and even very strong blue fluorescence. They glow in UV light (like in nightclubs) and under strong sunlight. Purists aren’t fond of the hint of blue in their supposedly icy-white diamond, but others like the cool luminescence. There’re just two sides to every coin. Which side are you on? Fluorescence can be seen in 1 out of 3 diamonds. Although you’ll find ones that cause a “milky” or “hazy” look that affects brightness, they are way outnumbered by fluorescent diamonds that have a stunning impact. The market-driven motive behind this misconception is to have consumers buy a “cleaner” but much more expensive stone. Don’t fall prey to this! Truth be told, Brian Gavin stopped selling diamonds with blue fluorescence in1998. This began when he noticed that many customers returned diamonds with blue fluorescence. Since this is just the beginning of e-commerce, people who bought online often had their diamonds checked by brick and mortar store owners. Of course, they were told that diamonds with blue fluorescence are undesirable and should be returned! 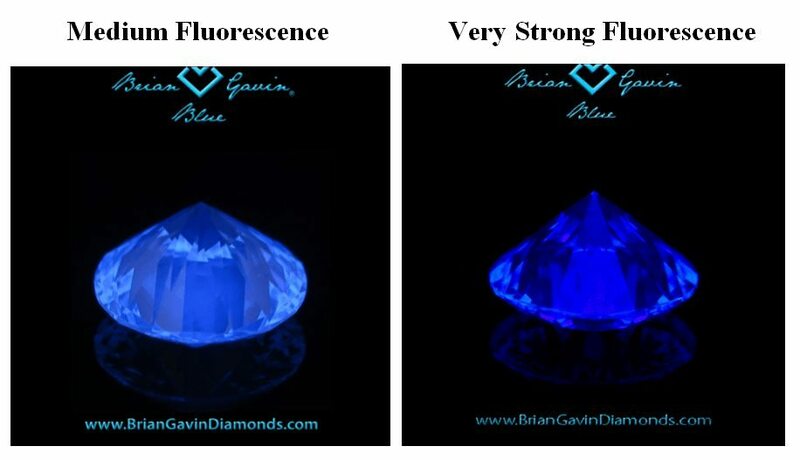 Due to the numerous returns, Brian Gavin stopped selling diamonds with blue fluorescence. But deep down, he knew that it could boost the beauty of a diamond when chosen the right way. This inspired him to create the “Blue” collection, and by 2009 he's offering blue fluorescent diamonds once again. As I have described in my post about diamond fluorescence, it can be a beautiful thing if you know what to look out for. I personally like how it can make a diamond appear whiter than its true body color especially in the lower ranges of G-K. This is actually what Brian Gavin promises in his Blue collection. Every single diamond is inspected by him personally and has to get his approval to be included in the signature line. 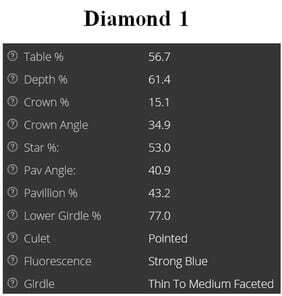 Another great thing is since the general diamond market has a prejudice against diamonds with fluorescence, these diamonds usually trade around 10%–15% cheaper than comparable diamonds without fluorescence. The stronger the fluorescence (strong or very strong), the more likely you will notice an icy blue glow under sunlight. Usually, a diamond with very strong blue fluorescence is much more likely to exhibit traces of haziness, but in Brian Gavin Blue diamonds, you don’t need to worry about that. 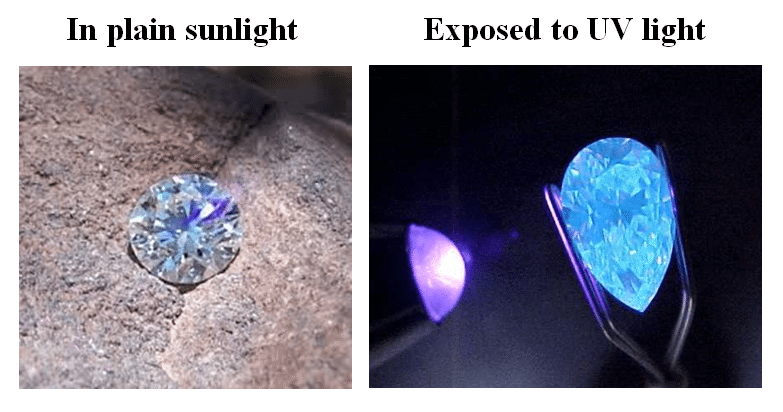 Of course, the effect becomes more evident when you shine a UV lamp onto a diamond directly in the dark. Here are images of fluorescence in the dark that Brian Gavin also provides aside from ASET and Idealscope images. Now, these only seem so strong on the picture because the setting is pitch-black. It’s also being illuminated by a UV lamp up-close. So, you really wouldn’t see this intensity on the daily. 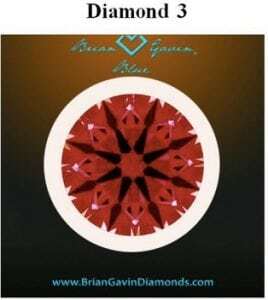 Are Brian Gavin Blue Diamonds also Hearts & Arrows Diamonds? Yes! With all the benefits of super excellent light performance! Thus, you can expect the same rigorous standards to be applied to Brian Gavin Blue. In my Brian Gavin Hearts & Arrows Diamonds Review, I described that these diamonds are not near Hearts & Arrows but True Hearts & Arrows Diamonds that you can rarely find. This actually surprises people as they think that if Brian Gavin Blue diamonds were true H&A stones, then they should be called Brian Gavin Blue H&A diamonds or something like that. Sounds reasonable to me. At least we know for sure that they’re legit Hearts and Arrows! 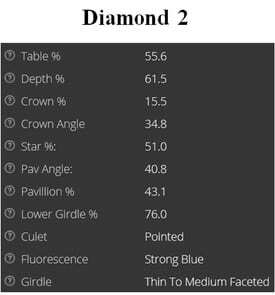 I know that many people get turned off by looking at exact diamond angles and percentages but let me just say this: All of these diamonds fall within the perfect diamond proportions as per my recommendation for super ideal cut diamonds. 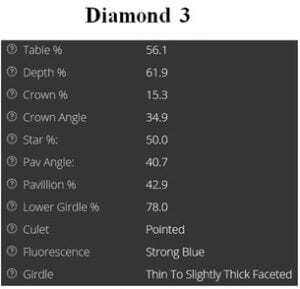 The only thing that slightly deviates from my suggested proportions is Diamond 3 with the girdle being thin to slightly thick. 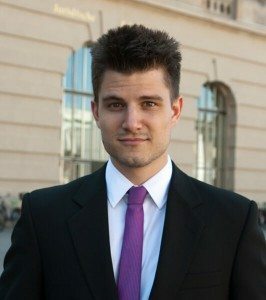 This is not a big deal, but in this case, I would prefer Diamond 1 or Diamond 2. Although Idealscope images only have the function of evaluating light performance, we can also use them to look at the arrows pattern of all three diamonds. If you were to buy one of these diamonds, you could easily ask the customer service for a real H&A viewer. But the images above already let you see that all the arrows of the three diamonds are distinct, crisp, and clear. Furthermore, what can be deduced from the Idealscope images is that none of them has any light leakage or areas of lighter (whiter) color. On the contrary, the ones above are nearly completely red. These Idealscope images are as perfect as they can be! Hopefully, this is something that you won’t have to do in the future. But if you decide to resell the diamond, one disadvantage you need to be aware of is, you might not get as much money back. On the bright side, you could still use Brian Gavin’s upgrade policy and receive 100% of the original purchase price if you upgrade to another Brian Gavin Blue diamond that is higher in 2 of these 3 things: carat weight, clarity, and color. 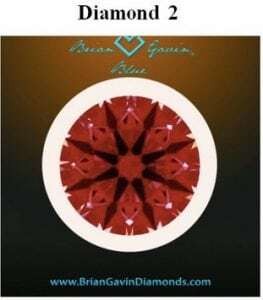 All in all, I must say that Brian Gavin Blue Diamonds truly live up to the superb cut quality of Brian Gavin Hearts and Arrows. The only deciding factor is: if you want your diamond to be as clear and sparkly-white as possible in all lighting conditions, stick to Brian Gavin H&A diamonds. Although if you’re on a tight budget, Brian Gavin Blue is much affordable, and you can choose the intensity of the fluorescence to make sure it won’t be visible under sunlight. But if you’re feeling frisky – the type that would be amazed by the diamond’s cool blue glow in a UV-lit setting and the icy-white sparkle by day, Brian Gavin Blue is for you. Should you have any question, drop a comment down below or write me a mail!